This section of the Happy Valley website presents details of Bollington’s cafés. Each page also contains a Google map. The location will be displayed in the centre of the resulting map. To see a wider area hold the mouse over the map and roll your mouse wheel backwards. The Google map also allows you to obtain directions to each location from your own location. 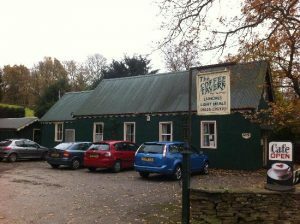 The Coffee Tavern (pictured above) is located in Pott Shrigley, but is handy if walking to Lyme Park via the West Gate.